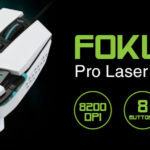 Kaliber Gaming by IOGEAR’s FOKUS Pro Laser Gaming Mouse is an eSports tournament-ready gaming machine, built with the speed and precision for peak performance with any game. FOKUS features eight user programmable buttons configured around an ambidextrous design, giving both right and left-handed gamers the ability to completely customize its functions with the Kaliber Gaming software. The FOKUS’s high-speed laser gaming sensor accurately tracks on a wide range of surfaces, and its rigid aluminum frame delivers rock-solid stability for whatever battles you face. FOKUS features five programmable shift on-the-fly resolution steps up to 8200 dpi for ultra-fast movement, perfect for 4K Ultra HD gaming.